If you are or hope to be in an intimate relationship you will want to give this book to yourself and your partner. 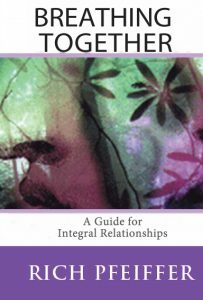 Breathing Together is an inspiring guide that offers encouragement and practical exercises for those seeking more meaning and healthy spirituality in their relationship. An Integral Relationship provides its partners the opportunity for growth and development of the self and partner, as well as emotional and spiritual healing. The author weaves professional knowledge with personal experience to show the reader how to thrive and find increased relationship satisfaction. 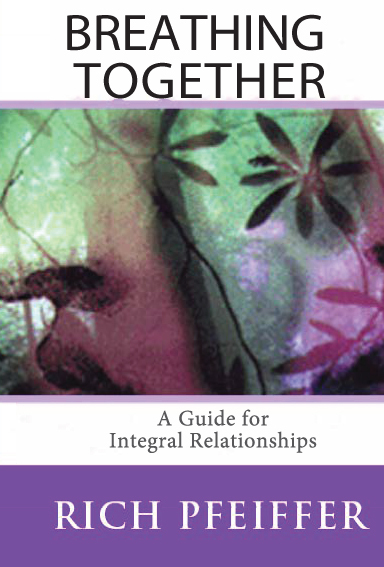 This essential book offers integral insights, practical skills and a map for the healing journey possible in relationships. The book is organized into four (4) Parts. Part I – Getting Integral, provides some basic framework for those interested in integral theory and the potential of Integral Relationships. The development process can be understood through the metaphor of the Climber(s) or the two Self(s), the Ladder, and the View. Part II – The Brain, describes some pertinent neuroscience research related to the Primitive Brain, Thinking Brain, and Integral Brain framework, which is an inherently developmental and evolutionary orientation. Part III – The Mind, describes the Primitive Mind, Thinking Mind, and Integral Mind – offering a discussion of the significance of the top-down and bottom-up processes in contest of Relationships. Part IV – Competencies and Practices for Integral Relationships, presents twenty-five (25) competencies for Integral Relationships. These competencies can be developed through a cross-training approach to some twenty-two (22) practices for Integral Relationships.